Nutmeg is an unassuming spice. The brown kernel has a pleasing sweet aroma but the magic happens when it is added to dishes containing dairy products or eggs. Nutmeg has been used in European cuisine since medieval times so no wonder there is a multitude of unique recipes using it; custard tarts, bread sauce, rice pudding, mulled wine and even haggis! 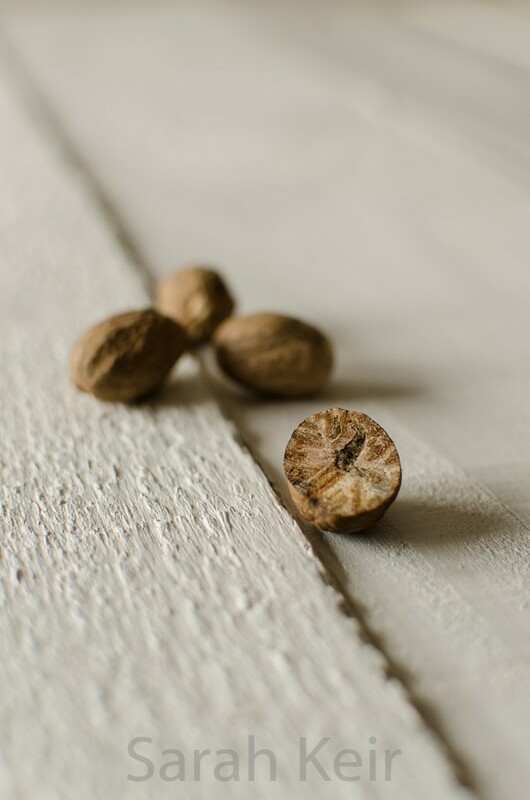 Nutmeg is the seed of a tree that indigenous to the Banda Islands in the Moluccas (or Spice Islands) of Indonesia, though now grown in the Caribbean and Kerala in India. Two spices are obtained from this tree, the other being mace which is the lacy outer wrapping to the nutmeg seed inside. Although mace and nutmeg are not identical in flavour, they are so similar that for most recipes they can be interchanged. Use mace for recipes requiring a whole form such as chutneys and pickles, and use nutmeg for when ground spice is required. It really does need to be ground fresh, as it quickly loses its power when ground; I keep a mini grater obtained from a Christmas cracker for this very purpose. As a little aside, nutmeg is supposedly a hallucinogen but you would have to eat rather a lot of it and the other side effects sound grim! Do not try at home! This recipe is adapted from ‘The Great British Book of Baking’ by Linda Collister. 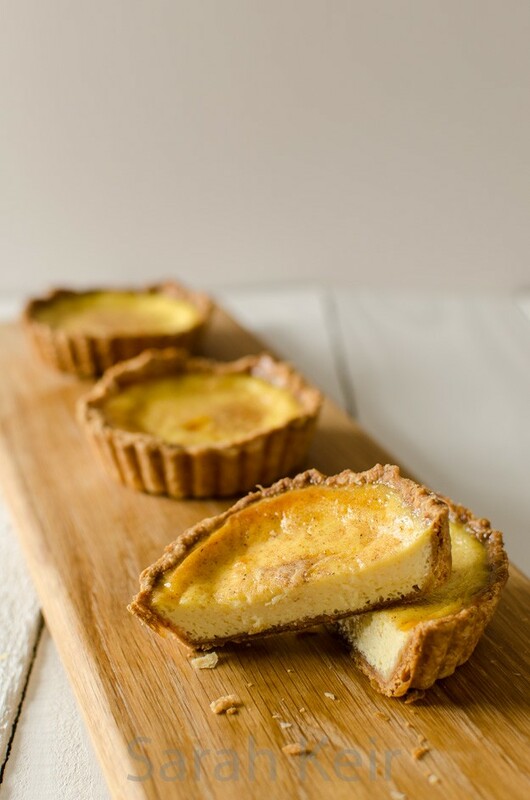 Make the pastry – rub the butter into the dry ingredients until makes fine crumbs. Use a round ended knife to mix in the egg yolk and some cold water until it comes together as a firm dough. Wrap in cling film and pop the the fridge for at least 30 minutes, but overnight is better. 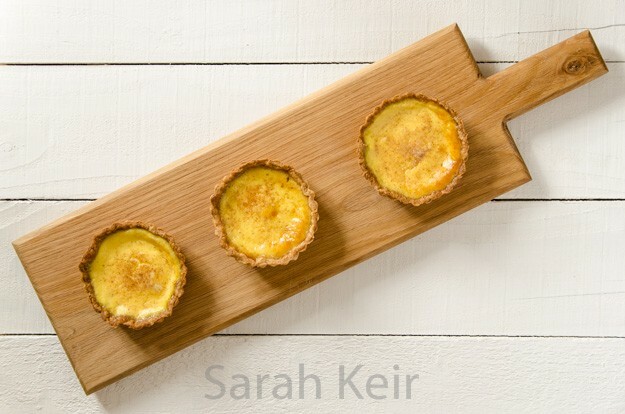 Roll out the pastry until thin and then use to line your tart tin; use a 22cm diameter round fluted tin with a removable base or several individual sized ones. Prick the bottoms all over with a fork. Chill in the fridge for at least 30 minutes (or freezer for 10 minutes if you are short of time). Preheat the oven to 200 ºC/180 ºC fan. Bake the pastry cases blind for 15-20 minutes. To do this, cut out a square of baking parchment a few inches larger than the tin, scrunch up the paper, flatten out and scrunch again. Flatten out the paper and lay over the pastry, fill with ceramic baking beans, dried pulses or even copper coins. Doing this cooks the base so you don’t get a soggy bottom and the baking beans stop the sides from collapsing. Remove the paper and baking beans and return to the oven for another 5-10 minutes. 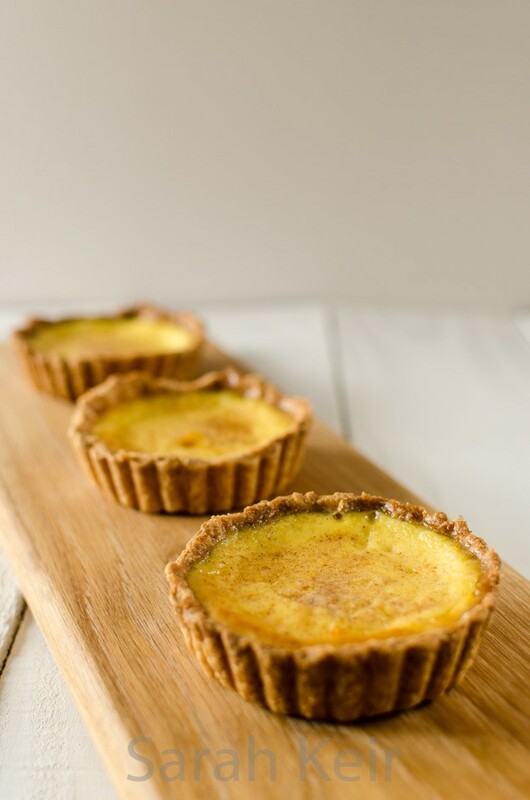 Take out of the oven and with a pastry brush, brush the pastry with one of the eggs (beaten) and return to the oven for 1-2 minutes. This egg layer means your pastry bottom really will not go soggy. Turn the oven down to 160 ºC/fan 140 ºc. Put the cream and milk into a pan and slowly bring to just below the boil, take off the heat and set aside for 5 minutes. Meanwhile eggs, egg yolks and sugar in a large bowl. Slowly pour over the hot cream/milk mixture, whisking constantly. Add about half of the amount of nutmeg you wish to add and transfer the mixture to a jug. Set you pre-cooked pastry case on a hot oven tray and place on the top shelf of the oven. Carefully pour in egg/milk mixture right to the brim, carefully slide it into the oven and close the door. Bake the tart for about 30 minutes. The middle of the tart should still have a bit of a wobble (the individual tarts took about 15 minutes). Leave to cool and serve warm or cool, with more grated nutmeg if wished. Best eaten the day it is made.